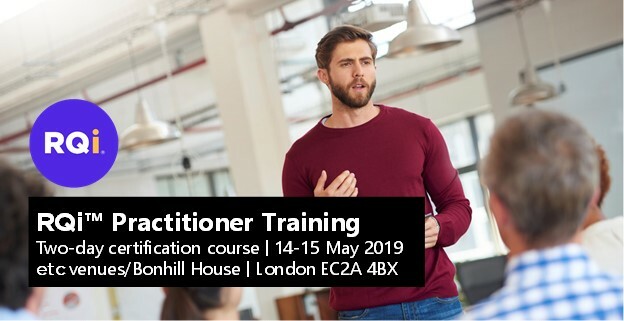 We're running the RQi Practitioner Training programme on 14/15 May 2019 at: etc.venues/Bonhill House (1-3 Bonhill Street, London EC2A 4BX). Those who successfully complete the course are licensed to use the RQi in one-to-coaching sessions with their clients (according to the Terms and Conditions of an RQi Practitioner). RQi Practitioner Training is £1150 + VAT per person. The fee includes all support materials and a customisable area on the Thrive portal to administer questionnaires and distribute reports to customers. Before the group workshops, participants are required to complete two e-learning modules as well as their own RQi questionnaire. The e-learning modules are delivered via the Thrive e-learning portal (www.thisisthrive.com). RQi reports are distributed during the workshops. The two-day workshop provides a thorough understanding of the composiite scales and sub-scales of the RQ as well as the skills required for coaching clients who have completed an RQi. After the workshop, participants are required to complete three practice coaching sessions (with family, friends and/or colleagues) in their own time. This is a multiple-choice and scenarios-based assessment designed to test knowledge of the RQi and the client feedback process. The pass mark is 75%. Download the RQi Practitioner brochure (it's quite a big file so may take a few moments).